Could not remember what I wanted to write about today, so I ended up checking the e-mails that Michelle Shaeffer had e-mailed us on Day 2. To be honest, this was not at all what my first impression was when I read : "Celebration of Life". I had a much more joy full feeling with this quote, all kind of things I am grateful for came to mind first. That is why I choose this picture, It feels alive, it shows sharing, happiness, kindness, the promise of food, companionship and so much more. When we plan for the "final celebration" of someones life, we do look for the things that made this person special. Every ones road follows a different path, and some of us follow a road that is long and hard. Tonight I received a referral for our volunteer organization. We are a palliative care organization, and we train volunteers to assist the client and their family to lead a meaning full life. Or in other words to help them to live life to the fullest at the very end of life. Celebration of life, we try to do this when the person is still with us, and able to share those special moments with his loved ones, so they will have these memories in their hearts for when this person is no longer living with us. It's interesting the ideas that come when we start wandering through what my husband calls "the google machine". 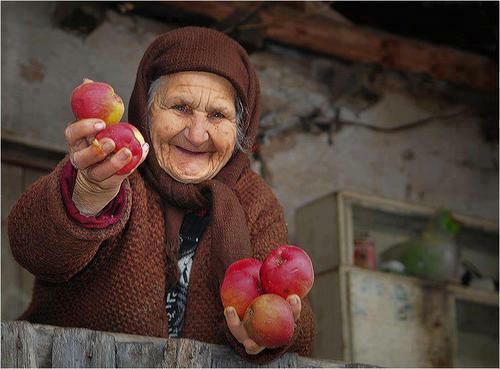 And I love the picture of that old lady--so warm and welcoming.